Review: "Panikk: Discarded Existence" - Sea of Tranquility - The Web Destination for Progressive Music! 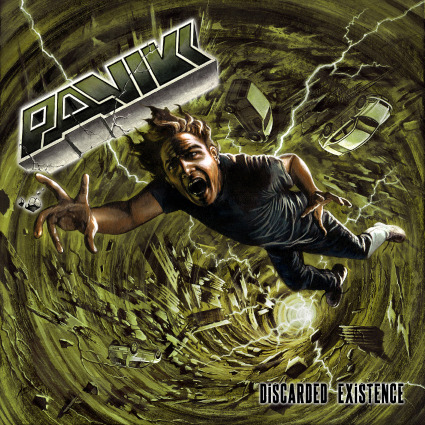 If there were ever a "language" of thrash metal it seems apparent with this collection of brutal sonic bullets from Panikk, entitled Discarded Existence. I say this honestly because it would not be possible to determine this band is from a newly formed country (Slovenia) that is only twenty-six years old. Beginning from the first track "Instigator of War" with its heavy early Anthrax overtones Panikk is an up and coming thrash/speed band that is not trying to reinvent the metal wheel. By sticking to a classic updated thrash sound and wonderful vocals by Gasper Fiere, Panikk is reviving an 80's thrash era where straight forward speed counted as a valid art form. Powerful tracks like "Individual Right," "Sealed in Utopia and "Discarded Existence" constitute the heart of this album and compliments should go to the musicianship of the players involved because their sense of urgency and authentic style embed a youthful passion in a genre of music that is approaching its fourth decade. I can easily remember thirty years ago when it was standard to include a classical instrumental homage in nearly every metal album produced and Panikk has brought this fantastic tradition back with its "Outro" a short acoustic-like piece inspired by the love of atmospherics in a decidedly bland radio-oriented world. I welcome Panikk to the metal fold with open arms.